A job offer letter used by the employer to propose a new employee an employment position. How Do You Explain Job Offer Letter? In the case of professional enterprises, an oral proposal is given first to the employee and then a written job offer letter is sent to the employee in order to be official form. This document is important to protect the interests of both the employer and also future potential employee. It is a very rational approach to all applicants to say that there are several candidates for the job and the one closest to the qualifications of the job will be chosen. A job offer can be made based on a medical examination or a diploma, such as submitting a certificate of expertise. Otherwise, the proposal should be revoked. 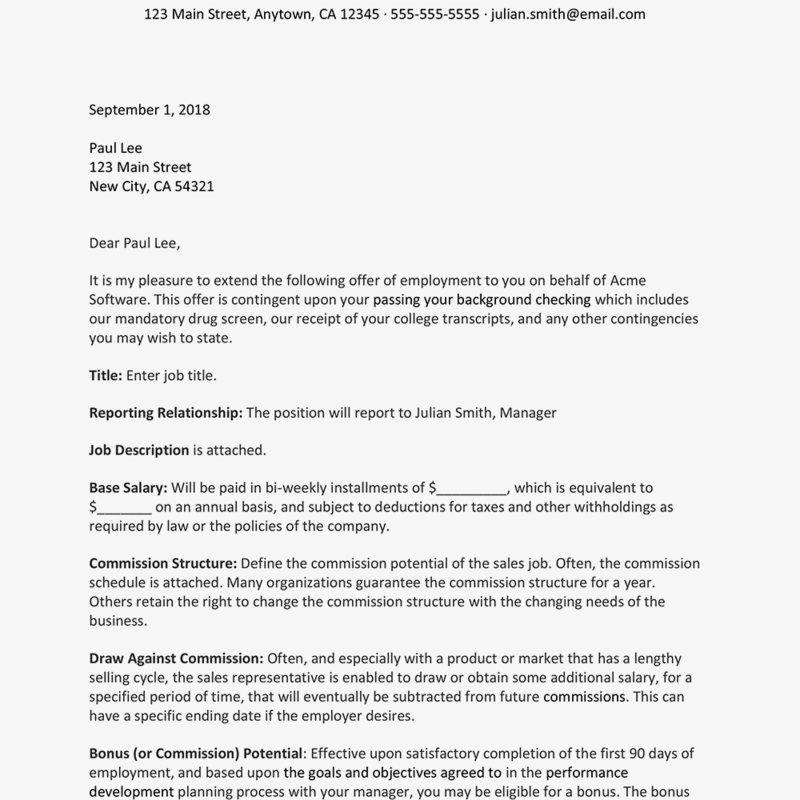 How Do You Make a Job Offer Letter Template? You should be started with a expression such as ‘Dear’ and write the candidate name (Like that ‘Dear John’). At the first sentence that starting with the company name, then important informations such as position, starting date and working time should be explained. A definite date for starting work should be written during this interview. Because, those who work at other jobs can not leave their jobs before the expiry of the notice period, even if they notify their employers immediately of their leave. In the job offer letter, the work must specify all conditions (overtime, meetings to be held outside of working hours) that may affect the applicant outside normal office work and hours. Detailed information on the proposed position and status should be included. The fee must be clearly stated during the job offer. The initial salary must be written for this position and it should be stated at what intervals. If there are special payments to be applied to the candidate, they should be explained as written. Company should be explained that will supply comprehensive benefit program such as healthy insurance. In a job offer, it is unfair to ask the candidate to decide at that moment. Candidates may want to make a calm assessment of the situation or consider other companies’ job offers. For this reason, the candidate should be given sufficient time to make a healthy decision. It is written to letter at the end of the job offer letter, ‘Please confirm by signing your job offer letter until the deadline’. You can use this job offer letter as a model form. CCC company would like to offer to submit a proposal for your work in the position of Quality Control Responsible. Your skills and experience will be ideal for the relevant department. Your start date will be 01.01.2019 and your initial salary is $2,000 per month and is paid on a monthly basis until first of the month (until from 1 to 10). CCC company offers a comprehensive benefits program, which includes medical insurance and will be effective on January 1. If you choose to accept this job offer, Please confirm your acceptance of this offer by signing and back to us this letter until deadline 20.12.2018. When you decided to join us, we will send you employee benefit enrollment forms and an employee handbook which details our benefit plans and retirement plan. We look forward to your participation to the CCC team. I hereby accept the Quality Control Responsible position.